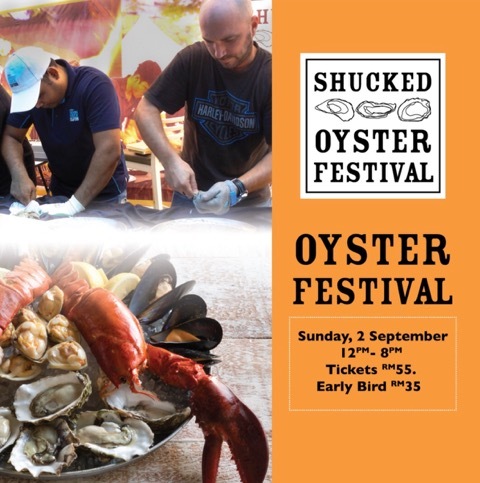 Come and experience our SHUCKED Oyster Festival on Sunday September 2. Bring your friends and family and we will delight you with a fine selection of the world’s best seafood, the finals of the Malaysian Oyster Shucking Championships, live music and drinks. To double the fun, buy your F&B vouchers online at https://shop.southernrockseafood.com.my/products/Oyster-Festival/67 for a cheeky 35 percent discount on festival tickets – only RM35 each compared to RM55 on the door. Each ticket entitles you to a flight of three oysters and a Guinness or glass of white wine to get the party started. As you enjoy the some of the world’s finest oysters and smoked salmon, our fabulous fish & chips, seafood paella, and famous mussels laksa, you can also grab a ring-side spot at finals of our Malaysian Oyster Shucking Championships. Fizly Bin Norazlan, 2017 Malaysian National SHUCKING champion will be defending his title against a strong field. Fizly represented Malaysia at the World Oyster Championships in Galway, Ireland and the Shuck Off China World Cup in Beijing, China during his championship year. Maestro Irish oyster grower, Edward Gallagher, will be on hand to judge the shucking (oyster opening) competition and proclaim the 2018 Malaysian National SHUCKING champion. The winner will take home RM1,000 and the chance to compete on the world stage in Ireland and China. The friendly SHUCKED Oyster festival is fun for all the family, with a wide range of seafood and other premium foods, a well-stocked bar and several bands. Stanley the Clown will keep the kids entertained, live jazz music will keep spirits high, and graffiti artist Iam May will complete her mega oyster doodle in real time. The healthy omega-3 oils, iron and minerals in our world-class seafood ensure you will have a good dose of happiness – especially when you discover our fresh oysters start at only RM6 a piece. The SHUCKED Oyster Festival is Southern Rock Seafood’s highlight event to delight Malaysians with the world’s best Oysters and Seafood in a friendly, bold and cheeky atmosphere. It builds world-class expertise in the Malaysian food industry by selecting the Malaysian Shucker for the World Oyster Championships in Galway, Ireland and the Shuck Off China World Cup. Established in 2008, Southern Rock Seafood imports and distributes live and fresh chilled seafood from the Atlantic and Pacific Oceans. Supplying most of KL’s top restaurants and hotels we also operate our own restaurant at our Bangsar HQ and a chain of SHUCKED Oyster and Seafood bars at Village Grocer (Arcadia and M-City), B.I.G (Publika, Ikano Power Centre and DC Mall), The Roof, Bandar Utama and The Gardens Mall, Mid Valley.